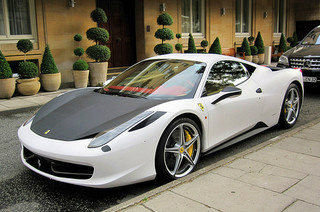 The Ferrari 458 sports car, a two seater Berlinetta, also designated the 458 Italia, was introduced at the 2009 Frankfurt Motor Show with a price tag of $275,000. It was the natural successor to the successful F430 which was discontinued earlier that year. As was the case with the F430, it retained E-Diff, the electronic limited slip differential, and F1-Trac, the electronic traction control system, plus electronic ABS and dampers, all connected to the Manettino switch on the steering wheel. Between them, E-Diff and F1-Trac increased the cars cornering abilities and subsequent acceleration out of the corners by as much as 30% over that of its predecessors. 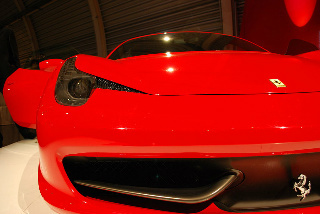 A unique feature of the 458 sports car was that the brakes were fitted with a function which caused the pads to just come into contact with the discs as soon as the car accelerated away. The result was that the distance taken to stop the car, in conjunction with ABS and Carbon Ceramic brakes, ws noticeably improved, with 62 to zero mph in just 32.5 metres. With body styling by Pininfarina, one interesting addition was that the front grille was fitted with small winglets which, as speed increased, began to change shape to reduce the cross section of the radiator intake, and so reduce drag. In this way, airflow beneath the car was increased, and by the time it reached the rear diffuser, it had generated significant downforce. Once again, the external styling emphasised the cars aerodynamic characteristics such that downforce was increased to 140 kg at 124 mph. The rear of the car sported very distinctive triple exhaust pipes. It used an aluminium body and chassis, with rear wheel drive on 20 inch wheels. 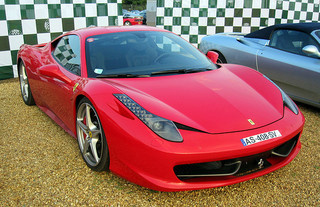 The slightly increased size and weight of the 458, compared with the F430, was more than countered by the engine's additional output. 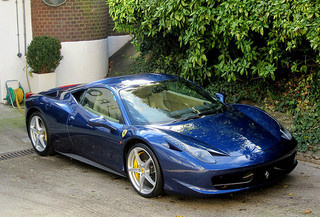 The 458 Italia sports car was powered by a 4.5 litre, V8 mid-engine, derived from the 4.2 litre, V8 unit specifically designed for Maserati following Ferrari's acquisition of that company, and which was first used in the F430. The engine developed 570 bhp at the redline of 9000 rpm, and 398 ft/lbs of torque at 6000 rpm, the majority of which was available around 3250 rpm. It produced a top speed of 202 mph, a 0-60 mph time of 3.3 secs, and an overall fuel consumption of 21 mpg. A feature of this engine was that it was fitted with direct fuel injection, the first time such a system had been applied to a mid-engine unit. Since the classic H-gate manual gearbox was not offered as an alternative, it was only fitted with a seven speed Getrag sequential unit, which could change gears in 40 milliseconds. It used dry sump lubrication, and employed a flat plane crankshaft to prevent uneven firing into the exhaust manifolds. 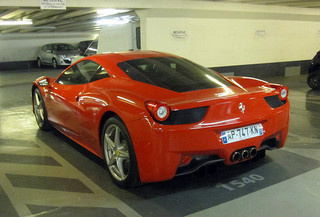 Compared with the F430, the compression was increased from 11.3 to a huge 12.5:1. A Ferrari 458 Italia sports car in good condition would fetch around $225,000, whilst one in showroom condition would command anything up to $350,000.